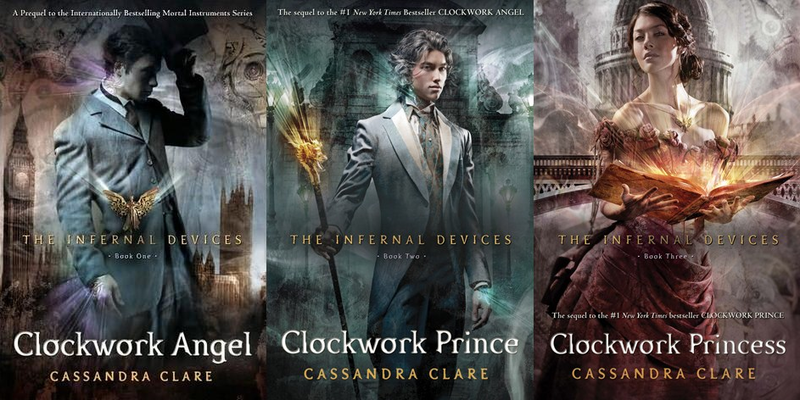 I know I am pretty late to the party when it comes to the Infernal Devices, but I have reasons for that … not any good ones, but still reasons … I’ve read the City of Bones trilogy (at least that’s what I believed it to be at the time) years ago – so many years, I don’t even remember. I read them in the German translation, so clearly the phase where I read everything in it’s original language hadn’t started yet. So, I was reluctant to buy anything associated with the series in English and I simply couldn’t get myself to continue reading it in German. But at some point I just couldn’t resist any longer. They look so pretty and they are about Shadowhunters – I mean that’s just cool! I’ve thought about this for a long time and I find it extremely difficult to do this without Spoilers, therefore there will be two parts to this review: one for everyone and one for the people who’ve read the book as well! The Infernal Devices is about the journey of Tessa Gray – about her encountering a world beyond what she thought was possible and of her realising what a special place she has in exactly that world. It’s a story about love, family, loyalty, honor and duty. I like the universe Cassandra Clare has created. Opinions tend to differ on this one; some people just never really get into it and that’s okay too. But I wasn’t one of those people, I got sucked in and loved it. Not many authors manage to develop a story with so many side characters, you barely know who you want to keep track of most. There was literally no one I didn’t like (except for the villains, who you still understood to some extant)! That doesn’t mean the characters are perfect, because as she states in the book “perfect is dull”, but they all have their quirks and habits that make them really lovable. Another plus: my all-time-favourite from City of Bones/Glass/Ashes Magnus Bane is in the books! The pace of the story felt exactly right for the time period it played in and all the references to “A Tale of Two Cities” were great! Overall I enjoyed it very much and could’ve spent decades more with the characters. Whoever said “You can’t have it all!” has clearly never read the Infernal Devices, because besides the immortality issue, Tessa Gray has about one of the best lives on the planet and she gets to live a whole and fulfilled life with both her true loves. I mean who gets to do that? Normal people have to choose! I understand that everyone loves troubled Will Herondale and it’s not like I don’t like him, but I don’t seem to have been as affected by him as others. The only scene I absolutely adored and that shattered my heart was when he thought Jem was dead and his parabatai-rune faded. Other than that I think he’s fun and funny, has great taste in books and apparently looks quite handsome. James Carstairs aka Jem is my second favourite character in the Shadowhunter world (next to the infamous Magnus Bane). I kind of preferred him to Will and hope people can live with that. When I thought he was dead I felt devastated and like a part of my heart was missing as well. Never would I have thought he would die, which essentially he didn’t, but I didn’t know that at the time. Very well played Ms Clare! I’m so glad he got to be with his Tessa in the end as well and I’ve read about a little sequel called “After the Bridge” which tells us more about what happened after the Epilogue of Clockwork Princess. I have to get my hands on that somehow!! Sophie, dear stubborn Sophie, I was so happy to see her become a Shadowhunter herself and find her love in Gideon Lightwood. He was smitten by her from the first second and that was just so lovely. Henry and Charlotte have to be the most adorable people ever! I love how strong of a person Charlotte is and even though I felt sorry for Henry getting injured, it doesn’t seem like a big issue and that’s great. Also, Charlotte is the perfect example of female empowerment for the time period. I still think it’s a little weird that Gabriel fell in love with Cecily because of his past with Will and her resemblance to him. Still, she made him a better man for sure. I have never heard Bridget sing, but her songs sound fascinating. I can imagine though that they would get on my nerves after a while. I feel sorry for Jessamine (although I’ve never particularly liked her) and hope she will find peace, even as a ghost. Oh my stars, this has become a looong post. What do you say? Any thoughts on the Infernal Devices from your side? Side note: I would like to see THAT becoming a movie or TV show!!! Until someone makes that happen, I will contend myself with the Shadowhunter show. So… Jem is my favorite!!! Hands down, as soon as Tessa met him, I was like “YES”, he’s just so EVERYTHING! If you’re a Jessa fan, you just have to read it (it’s amazing!). I love Will for sure, but after reading Jace, Will is just so like him… I liked him, he’s funny, gorgeous and has some steamy scenes, but I always rooted for Jem. But Will’s relationship with Jem was just so great, I liked it far better than Jace/Alec parabatai bond (maybe because that one will always be “tainted” by Alec’s unrequited love for Jace). Have you read the 3 last The Mortal Instruments? Thank you soo much for the link! I was at work all day and couldn’t really look for it! I am Jessa all the way! I love Will and Jem’s relationship more than anything. And you are absolutely right about everything you said paralleling them with Jace and Alec’s story. But no, I have not read the other books yet. As I said I read the first ones in German and I don’t want to buy the others in English and not have them fit together. So I want to buy a boxed set with all the six books in English, but that’s expensive 🙂 The things I do for books!! Still, books 4 to 6 are pretty great, and Alec becomes one of the most amazing characters and then there are some cross references between the books (Easter Eggs all around!). By the way, This should totally be a tv show or a movie trilogy, I can actually see it working better as movies than TMI did, because it spans through more time. Well, I do intend to read them, I just don’t know when. I wasn’t so sure at first, but now I am deadset!! I love cross-reverences and while I started to read After the Bridge, I think I am going to wait until I’ve read the other books. Now I’m even more excited .. darn me and my curiosity! But I can do this! I can totally wait …. All the unspoken feelings and everyone holding back is so frustrating, but typical for the time period. I don’t know how those people didn’t burst with emotion. I thought I’ve read somewhere that Jem was still alive before I got to book 3, but when everyone thought he was dead I was shocked/devastated/confused. I couldn’t believe it. “How could they have taken my Jem? ?” was pretty much all I kept thinking even though I knew he would live somehow. I am so excited about the new books Cassandra Clare is working on. One has a parabatai forbidden love-story and that just intrigues me to no end! Yes, tou will meet Emma and Julian in boom 6 of TMI. Oh yeah! Where it says something like the Herondale and Carstairs kids are going on adventures together, right? That ought to be amazing! Today is one of those days where I just want all of the books that are out there … like right at that moment, even if I can’t actually read them all at the same time. I ordered two this morning: My Heart and Other Black Holes and We All Looked Up – I’m so excited to get new stuff to read! Although I should probably work on diminishing my TBR-pile … it’s a bad habit of mine to just buy it all and then not read everything … but I always say you have to be in the right mood for some books to be enjoyable. Lol!!! You do have to be in the right mood for everybook!!! By the way, just read eleanor & Park and it’s gorgeous!!!! That’s always good to know!